I make these hand held crosses with polymer clay and shape to fit the hand. They may be used as a tactile focusing tool for personal prayer and meditation. A local ministry recently ordered 50 hand crosses to be included in comfort kits for cancer patients. Working as a prayer is inevitable as I work on an order like this. Even though I was pushing an overdue deadline, while preparing for large shows at the same time, the power of the end use of these hand crosses, slowed me down to form each cross with an intention of prayer. Dear Lord, help me to always fill my work with you, with focused intention, in continual dialog with you. “Collaborations of the Spirit” will take place at Duckie and the Grackle Gallery in Lake Jackson, Texas on July 22, 23, and 24. 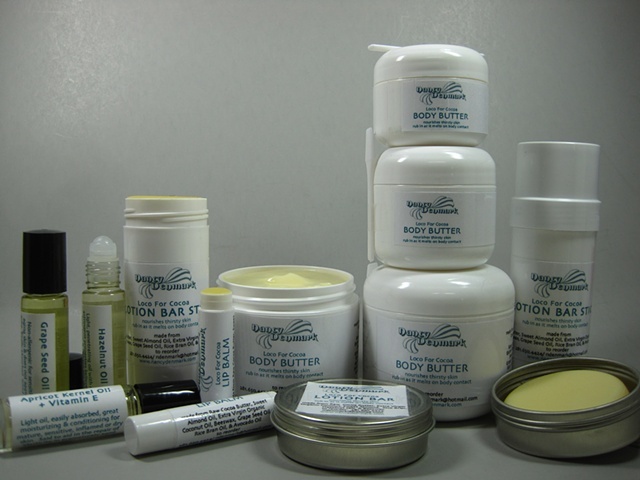 The gallery is located downtown at 145 Oyster Creek Drive in Suite 9. While featuring the collaborative projects, the three-day show will also include the individual work of each artist. Come to meet the artists and preview their work at an opening reception on Friday, July 22, from 5pm until 8pm. The show will continue on Saturday from 11am to 5pm and Sunday from 1pm to 5pm. Much of Nancy Denmark’s newest work has been collaborative as she finds refreshment of her creative spirit in working with other artists. Nancy Denmark and Margaret Bailey’s first collaborative piece was made years ago at the request of a mutual customer to mount one of Nancy’s sterling symbol jewelry designs on one of Margaret’s cedar wall crosses. This opened the door for a new artistic journey and Nancy now finds herself seeking out and inviting other artists to collaborate with her on new projects. This show will be the first exhibition of work created in collaboration with Celia Clowe. Celia has incorporated some of Nancy’s soulful symbolic designs onto her one-of-a-kind Spirit Blocks using etched and embossed metals, and polymer clay. Both artists concur the presence of the Spirit was evident in the creative sparks when Celia and Nancy met to infuse their unique voices into the new collaborative Spirit Block project. 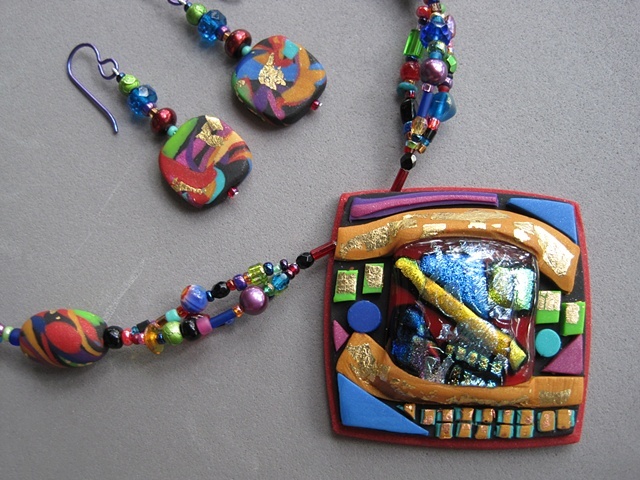 Nancy Denmark is a jewelry artist by profession & obsession, yet plays in many art forms. This playful approach has led Nancy in many new directions outside the “jewelry box”. Her materials run the gamut from precious metals to polymer clay. 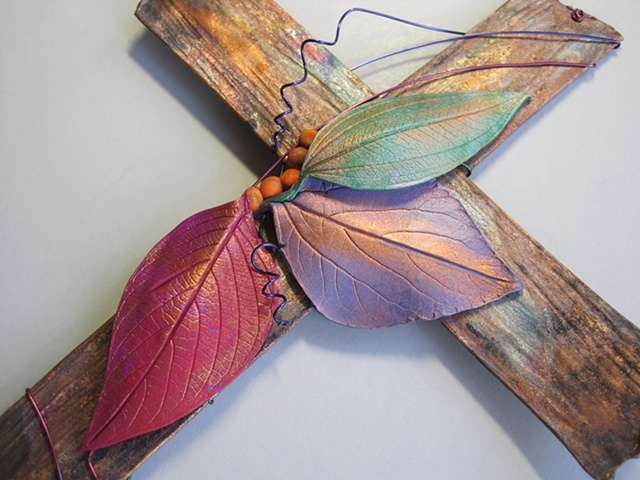 Nancy says, “As an artist, I try to remain open, willing, always listening and discerning how I am being called to use the gifts I have been given.” Known by many for her original jewelry designs that incorporate Christian symbology, Nancy has been creating these wearable statements of faith for 25 years. Margaret Bailey, a wood artist, finds inspiration in the quote “God rides the lame horse, God carves the rotten wood”. 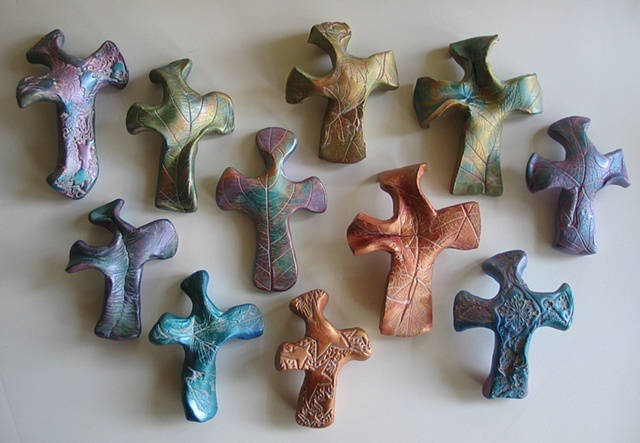 She handcrafts wood crosses, nativities and symbols by carefully choosing and studying the unique grains, knots, and features of each piece of wood. Many of her crosses are made from local Quintana Beach driftwood. Margaret allows the journey of the wood, to lead her to what she will make from it. Her pieces are all sanded to a silky smooth finish adding a soothing tactile experience to the visual beauty of her work. Celia Clowe is a mixed-media collage artist, self-described as an overeducated geologist with a Renaissance collection of skills and talents. Celia’s artistic journey has led her to create original Spirit Blocks, smallish 3D mixed media wooden blocks. Celia invites you to connect with the Spirit Block that speaks to your soul and place it where it can be glimpsed often as a reminder of the fullness and celebration of the Spirit within you. All three guest artists, along with gallery owners Cherie and Glenn McBride, share a bond of faith as members of a national community of artists who work at the intersections of art and faith. All value the significance of visual imagery in spiritual formation and create in response to their own faith experience. The influence of nature is another significant kindred connection that is obvious in the work of these five artists making for a very cohesive gallery exhibition. I ran across this quote this morning that sustains the theme of my recent blog posts. I have learned to recognize my thoughts while working, as a form of prayer, and my continual inner conversations to be conversations with God, therefore a form of prayer. I know I would benefit from more intentional quiet time in prayer but I find that I am not so disciplined in my prayer life. My life is hectic. Yet, I am grateful of the awareness that I can live out my life as a prayer. Everything I do can be a prayer, so maybe there is more intention there than I realize. At least there is an intention to live my life as a prayer. Just reflecting here on this quote. Any commentary? Thoughts from others are welcome. I’ll close with another quote from Mother Teresa that speaks to living life as a 24 hour prayer. I am a jewelry artist by profession and obsession, but create many things in a variety of mediums. My inspiration comes from a higher source outside myself. I am a faithful "co-creator". MY WEBSITE I have designed and created all of the artwork shown on my website. I am primarily a jewelry artist.